Active Directory migration is now a very simple and straight forward task but still few important things you need to consider before you jump into migration process of your active directory domain controllers. As per the below diagram techsupportpk.com domain has single domain controller with all 5 FSMO role running on Windows server 2012 R2. Domain and forest functional level currently operating at Windows server 2012 R2. We will add a new domain controller with Windows server 2019 and it will be the new FSMO role holder for the domain. once FSMO role migration completed, Domain controller running windows server 2012 R2 will be demoted. After that, forest and domain function level will be raised to the latest available version. In this demonstration, we are using Win2K12R2 as the domain controller hostname for windows server 2012 R2 and Win2K19 as the domain controller hostname for windows server 2019. These steps can also be applied if you are migrating from Windows server 2008 R2 to Windows Server 2019 or Windows server 2016 to Windows Server 2019. Note: When you add a new domain controllers to the existing infrastructure it is recommended to add it to the forest root level first and then go to the domain tree levels. Log in to the Server 2019 as a member of local administrators group and join your server to domain. After restart, log in to the server as Enterprise Administrator. 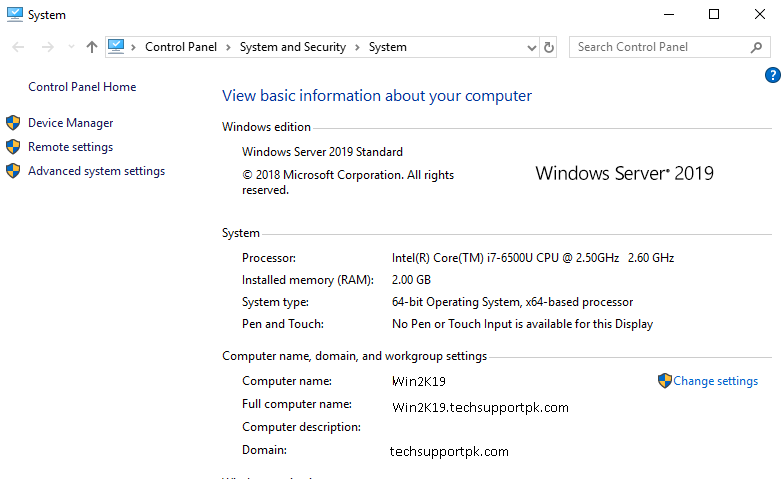 Make sure to replace Win2K12R2.techsupportpk.com with your existing FQDN. Once execute the command it will ask for SafeModeAdministrator Password. Please use complex password to proceed. Execute the following command to list down the domain controllers along with the IP address and Sites it belongs to. Make sure to replace Win2K19 with your Windows Server 2019 computer name. This will confirm that you are now running all 5 FSMO roles on Windows Server 2019 domain. At this point we need to demote the old windows domain controller which running with windows server 2012 R2. To do that execute the following command as enterprise administrator from the relevant DC. Once execute the above command it will ask to define password for the local administrator account. Make sure to replace techsupportpk.com with your domain name. Note: With windows server 2019, there is no domain or forest functional level called windows2019 so we have to keep 2016. Now you have successfully completed the migration from Active Directory domain services from Windows 2012 R2 to Windows Server 2019.